At Chemtech Alloys Pvt. Ltd we manufacture a precisely engineered range of Duplex Steel Pipes. These pipes are available in a spectrum of lengths and breadths to suit your requirements. This range of Duplex Steel Pipes or Supper Duplex Pipes is made using the superior quality steel, combined with all the newfangled technology. The Duplex Steel Pipes, we manufacture, have high durability and are resistant to corrosion. We have a loyal clientele for our products both in India and overseas, who laud us for the quality of our Duplex Steel Pipes and efficiency in serving them. 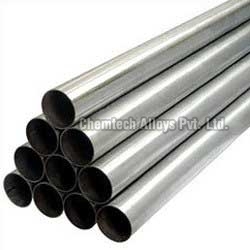 Their trust has positioned us amongst the leading Duplex Steel Pipes Exporters and Suppliers. The Duplex Steel Pipes are available at very reasonable rates.